Mariah and Camille are a riot. 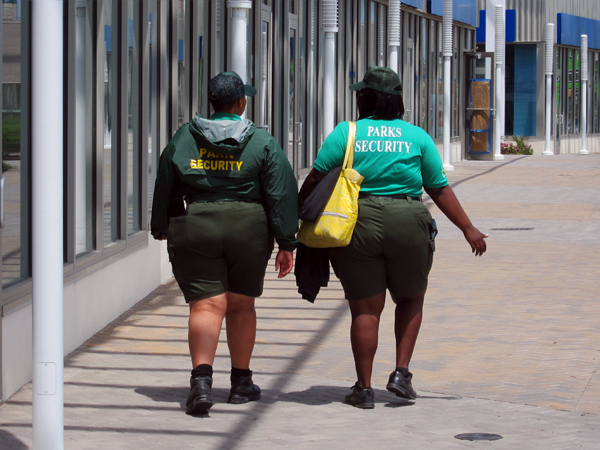 They work Parks Security for the Rockaway Beach section of Averne. They're supposed to be watching out for bad-guys and bullies, but sometimes I think they're the ones you should watch out for. All they do is make fun of everybody! Well, I don't actually know for a fact that they make fun of everybody, but I know that they definitely make fun of me. When I asked them to take a picture with me, they laughed in my face, so I had to sneak it on them, as they headed for the A Train, bound for home after a hard day in the hot sun.